Syracuse University provides several kinds of leave to assist non-academic staff and other eligible employees in balancing the demands of the workplace with their personal needs. If a regular work schedule is less than 20 hours per week, an employee is eligible after working 175 days. Faculty continue to be eligible for leaves of absence and paid parental leave benefits, and may request administrative leave through their departments, as appropriate. New York’s legislation establishing Paid Family Leave does not apply to those working in a teaching capacity. Full benefits are scheduled to phase in over four years, until reaching 67% of pay for up to 12 weeks in 2021. All staff will see this deduction beginning January 1, 2019. Deductions will not be taken from student employees or graduate assistants; however, they are covered by PFL upon meeting the eligibility requirements described above. Deductions will not be taken from faculty. They are regularly scheduled to work less than 20 hours per week, but are not expected to work 175 days within a 52-week period. Signing a waiver is voluntary, and an employee may revoke a waiver at any time; however, the eligibility requirements must be met in order for a leave to qualify for benefits. If an employee who signs a waiver has a change to their work schedule that would result in eligibility, the University will automatically revoke the waiver. When you anticipate the need to take a Paid Family Leave, you should notify your supervisor and submit your request 30 days in advance. If the event requiring leave is not foreseeable, you must provide notice as soon as possible. Complete the below forms to request the type of leave you need. Be aware that each type of leave requires its own documentation. If your leave is to care for a family member, the family member must authorize the release of their personal health information, and their health care provider must certify that they require care. Monitor your syr.edu email account for acknowledgement of your leave request and notification that your leave was approved or denied. 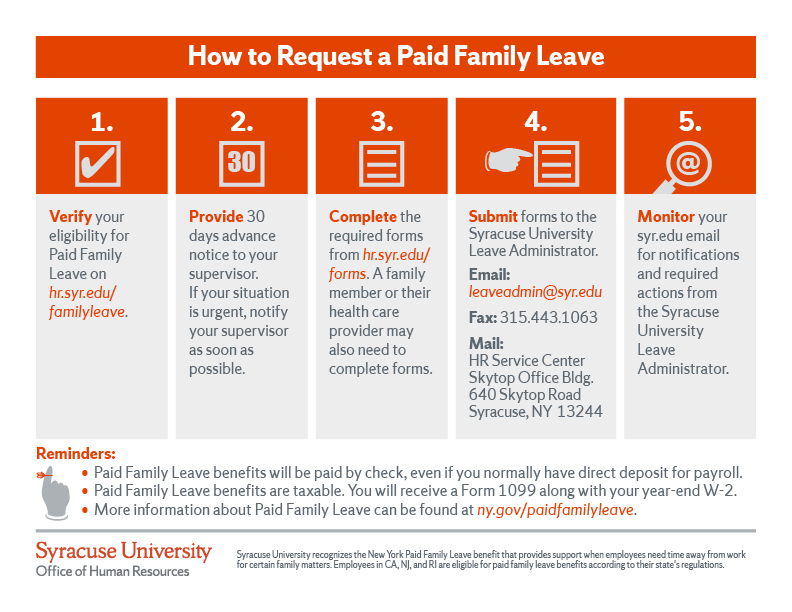 Review the Frequently Asked Questions for more information about Paid Family Leave benefits at Syracuse University. Contact the Leave Administrator at 315.443.4042 or email leaveadmin@syr.edu with any questions about Paid Family Leave.